New pictures of Saturn's enigmatic moon Titan, taken by cameras aboard the Cassini probe that are capable of penetrating the thick smog-like haze that blankets the frigid world, show strange looking surface features and a deck of methane clouds the size of Arizona. But so far, the instruments have not detected reflections from the surfaces of lakes or small seas of liquid hydrocarbons many scientists believe must form in the ultra-cold environment. 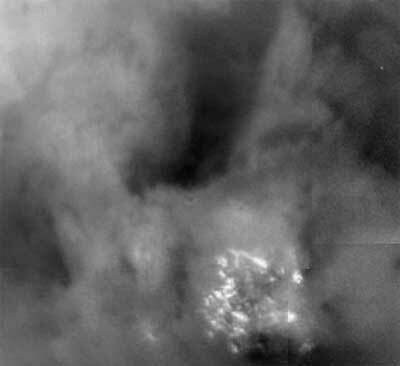 Piercing the ubiquitous layer of smog enshrouding Titan, this combination of images from the Cassini visual and infrared mapping spectrometer reveals an exotic surface covered with a variety of materials in the southern hemisphere. Image: NASA/JPL/University of Arizona. But like the sun glint off rivers and lakes visible from airplanes on Earth, the reflections in question can only be seen in a small region of Titan, about 1 percent of the visible surface, based on the relative positions of the sun and Cassini. "If we go by 30 times and we haven't seen it, we're going to start getting worried," said Kevin Baines, a member of Cassini's Visual Infrared Mapping Spectrometer team. "But I'd say so far, just going by once, it may have been that the specular reflection point was a continent, a dry area. "So the planet could have plenty of liquids and we just got faked out. We don't know," he said in a telephone interview. "It's just 1 percent of the planet, we shouldn't reach any conclusions from that." Cassini's first flyby of Titan, the day after the craft braked into orbit around the ringed planet, was at a distance of more than 200,000 miles. 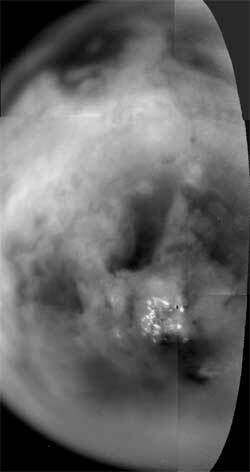 In October, the nuclear-powered probe will pass within just 745 miles of Titan and "we really expect to get a great view then," said Elizabeth Turtle, a member of the Cassini imaging team. A mosaic of Titan's south polar region acquired as Cassini passed by at a range of 339,000 kilometers (210,600 miles) on July 2. These images were acquired through special filters designed to see through the thick haze and atmosphere. The surface features become more blurry toward the limb, where the light reflected off the surface must pass through more atmosphere before reaching the camera. The bright spots near the bottom represent a field of clouds near the south pole. Image: NASA/JPL/Space Science Institute. In the meantime, "I can't tell you how excited I am to be able to show you the images we've got of Titan," she said at a news conference today. "These are just spectacular. It's our first good look at Titan and Titan hasn't disappointed us. It's different from anything we've ever seen before." Using filters to look through specific spectral "windows" in the hazy atmosphere, "we're seeing surface features as small as 10 to 20 kilometers (six to 12 miles) across," Turtle said. "This is 10 times better than what we saw during approach. It's a huge improvement." A mosaic made up of the best pictures from Cassini's long-distance flyby show a broad region of Titan's surface stretching from just above its equator to the moon's south pole. A large dark feature vaguely resembling the letter H on its side was visible at the top of the mosaic. The equatorial zones below were dominated by brighter areas while a large deck of clouds was prominent near the south pole. Drifting some nine miles up in Titan's thick nitrogen atmosphere, the clouds clearly moved and changed shape in pictures shot over a five-hour period. "These are dynamical clouds and a meteorologically interesting part of the planet where storms might be happening," said Baines. "There's speculation that it may even be associated with a feature on the ground, so we may have some wind motion lifting up air, methane moisture-laden air, to the point where it can condense out and form clouds." 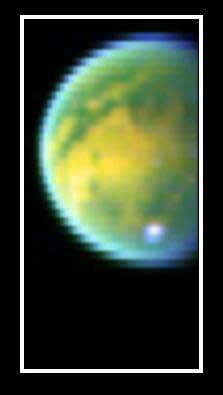 Titan's atmosphere is made up primarily of nitrogen with small levels of methane and molecular hydrogen. Nitrogen and methane combine in the atmosphere but the action of sunlight, even at Saturn's distance, causes the compounds to disassociate and hydrocarbons fall to the surface. Based on a variety of lines of evidence, including a surface temperatures as low as -292 degrees Fahrenheit, scientists believe those hydrocarbons must exist in liquid form, as lakes or large pools. It's also possible Titan is more like a giant sponge, with liquids filling cavities in the materials making up its surface. Based on Cassini's initial, long-distance flyby, the questions remain open. But scientists were nonetheless disappointed not to catch that tell-tale glint on the mission's first try. "The simulations I've done indicate that if the surface liquid is calm and not roughed up a lot by waves, it would be enormously bright, it would be the brightest thing we would see on Titan," said Bob West, a scientist at the Jet Propulsion Laboratory in Pasadena, Calif. "The calculations also show you can have quite a bit of overlying haze and even with a rough surface, I would have expected to see it by now. And we haven't." Even so, Turtle was elated at what the pictures did show. "It's dangerous to start interpreting a brand new surface that we've never seen before, especially on so little sleep," she said. "But we can't really resist. We're seeing surface brightness variations, we're not seeing topographic shading, the same way you would on a cloudy day on Earth, you don't see shadows or anything like that. "What we're seeing is just variations in the brightness of the surface. We see some surface features that are circular, others are linear. There are some features that look like they're rather concentric to near the south pole. ... And the sense that we're not just seeing circular blobs all over the place suggests it's not just a heavily cratered body, that there has been geologic activity on Titan. "Now, it's anyone's guess as to what that has been, there are quite a lot of candidates, But from these images, we can't say what the geologic activity has been." She said the apparent fuzziness of the surface could be the result of overlying haze, but "we are seeing some fairly fine detail as well." Perhaps not surprisingly, the Cassini data already has forced scientists to change their thinking about the processes going on at the surface. "It had been hypothesized that the dark materials on Titan are hydrocarbons that have fallen out of the atmosphere," Turtle said. "There's a lot of methane in the atmosphere and that gets processed and it falls out onto the surface in simple and complex hydrocarbons. It's been hypothesized that the dark areas were regions where that material had accumulated and that the bright areas might actually be cleaner water-ice regions that were perhaps even swept clean by methane rain coming out of the atmosphere." That was the theory until Friday night. Data from the infrared mapping spectrometer, Baines said, indicates "the brighter areas are mixtures of water ice but there's a mixture of other things in it which contributes to the brightness. So we think there are organics that contribute to that brightness. The brighter areas have been contaminated in a sense with organics, the dark areas are more pure water ice." In other news, Don Gurnett, principal investigator with Cassini's Radio and Plasma Wave Science experiment, played a recording of particles slamming into the spacecraft as it passed through the plane of Saturn's rings. Moving at some 53,000 mph, Cassini crossed the plane between the F and G rings, a region thought to be devoid of large particles that could cause any serious damage. Playing it safe, the spacecraft was oriented with its big dish antenna facing forward to act as a shield. As it turned out, that was probably a good idea. Gurnett said his instrument recorded 680 impacts per second, some 100,000 in all, during the ascending ring plane crossing and a similar number on the other side of Saturn as Cassini flew back down through the plane. The average size of the particles was on the order of a thousandth of a millimeter, about the size of smoke particles. But some were possibly as large as a tenth of a millimeter. "When one of these particles comes in and hits the spacecraft, it essentially makes a little explosion," Gurnett said. "Hopefully the particle's not too big so it would go through the spacecraft. ... When that explosion occurs, there's a little puff of gas that's produced, part of it is spacecraft material and part of it the particle. And it's heated to like a hundred thousand degrees. And this puff of gas, which is ionized, when it expands over our (instrument) antenna, some of the charge is collected on the antenna and it makes a voltage pulse." He then played a recording of the impact data, converted into an audio file, which sounded like heavy rain hitting Cassini as it plowed through the ring plane. "I would say it was a good thing to have (Cassini's dish) antenna pointed into the direction the particles were arriving," he said. "That was a good move."